Last summer, Matt Tate made a call that changed his life. Tate had been trying to get his reclaimed furniture and décor business, Timbr and Moss, off the ground for the better part of a year. He’d had some successes locally, but nothing sustainable enough to begin throwing caution to the wind. Then he made a cold call to organizer’s behind Portland’s Street of Dreams, an annual showcase of luxury homes in the Portland area. “I found their number online, called them and ended up leaving a voicemail. 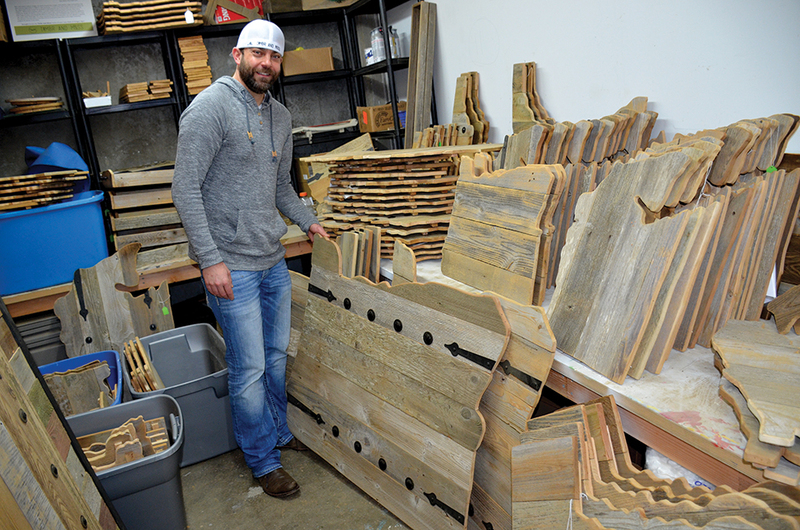 I told them I was a new upcoming company specializing in barn wood décor and designs and I thought I had something they would want to check out,” said Tate, whose workshop is on River Road North in Keizer. Within 24 hours, the Street of Dreams organizers called back to arrange a meeting. Five minutes into the meeting they told him they wanted to arrange a three-year deal to showcase his work in Street of Dreams homes. Tate’s trademark product are what he calls “state boards,” reclaimed wood he brings back to life and transforms into the outlines of a given state. Each section is cut individually and then pieced together giving the whole project a rustic feel. Depending on customer preferences, he can add any of a variety of embellishments ranging from door hinges to hearts to backlighting. The state boards are what caught the eye of the people behind Street of Dreams, but he’s also made clocks, serving trays, bat houses, custom business signs and a variety of other interior decorating items. The call to show off his wares at Street of Dreams turned into a flurry of activity for the following month. “I built as much product as I could, with a lot of friends helping, and went up for the first weekend exhibition with $40 in my wallet, but it was a hit from the get-go,” Tate said. For the next four weeks, Tate spent almost every waking hour in his shop making products to take to the Street of Dreams events each weekend. Some friends would show up after work to assist, others volunteered in his booth on the weekends. “I kept challenging myself each week to see how much I could build and, each time, I showed up with more. I would still sell out,” Tate said. By the time the final weekend of the event rolled around, Tate had a goal and made himself a vow that anything on top of that goal would be used for a company truck. He ended up blowing through his goal and soon after found himself sitting in his new truck outside his workshop trying to figure out how he was going to fulfill nearly 350 online orders generated during the course of the Street of Dreams exhibition. “I knew I could be successful, but it was so much more than I expected. Some of my customers had to wait a few months, but we only lost a few orders,” Tate said. Tate grew up on a farm in Canby and that was where he started making things. “I was always messing around with wood and building. On a farm, there was always something to build and build with,” he said. After studying architecture at Western Oregon University, he ended up working as a sales rep for AT&T and traveling throughout Washington and Oregon with the company, but he never gave up his woodworking hobby. A little over a year ago, he produced a large Oregon state board for a customer whose home was going to be featured on the Salem Tour of Homes. It generated several other orders for state boards and custom projects. He started filling the orders from his garage before contracting for a workshop on River Road. Another customer invited him to be part of a décor show in Salem and the ball slowly kept rolling. Tate was nearly at the end of his financial rope when he decided to cold call Street of Dreams. Everything since has felt like chasing a tornado. He’s hired a part-time bookkeeper and two part-time builders to help him fill orders. Tapping into relationships he built as a sales rep and other contacts he’s made since those days, Tate’s been able to build up a steady stock of the wood he needs and a loyal customer base, but he’s got several other irons in the fire. He’s in talks with a Portland sports team for a potential new line of products and he’s constantly trying to add to the look of his bestsellers, the state boards, which start for as little at $38 for smaller ones and can run in the hundreds of dollars for larger pieces. “We are going to be introducing skylines on the state boards and then some other landmarks from around each individual state,” he said. Tate has developed designs for every state in the Union and has sold about 40 different ones. Beyond the business itself, Tate wants to lay the foundation for a youth program that brings students into the shop and teaches them how to tap their creativity and turn it into entrepreneurship opportunities. “When we all work together, we all win together. Every customer and client is part of this journey and I want them to feel like they were part of something they believe in,” Tate said. For more information about Timbr and Moss products, visit www.timbrandmoss.com. Samuel Elder, a senior at McNary High School, recently completed the requirements to achieve the rank of Eagle Scout in the Boy Scouts of America. To become an Eagle Scout, a scout must complete a culminating project which involves planning, leading, and carrying out a service project that will benefit a community, religious institute, or school. Elder followed in his father’s footsteps by restoring two hiking trails in the Santiam Pass working under the direction of the Detroit Forestry Department. 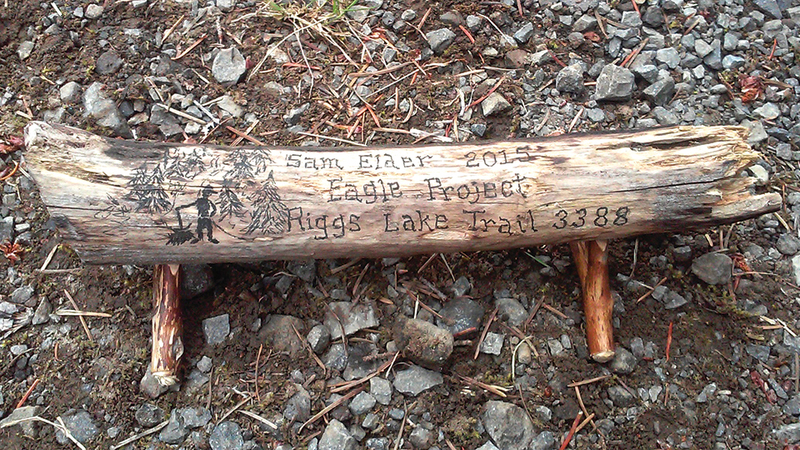 Twenty-five years ago, Elder’s father restored the trail head for Riggs Lake, and then surveyed and created the Don Lake trail for his Eagle project. After more than two decades, the trails needed maintenance. Don Lake trail had gotten so bad, the forestry department had trouble believing it ever existed. Thankfully, his father was able to retrieve paperwork showing the work he had done. It took another three months of reading over regulations and having multiple meetings with Detroit Forest rangers to make sure correct specifications were met. From April, 2015 to December 2015, Sam planned the project and organized and trained a group of people to restore the Don and Riggs lake trails. The group contributed 422 total hours, 78 hours were Elder’s alone, into clearing and restoring the two trails. Restoration began in July. It took three Saturdays to cut away limbs extruding into or trees lying on the trail, dig water runoffs, remove brush, and rebuild parts of the trail. Coordinating with members from his church, other Boy Scouts, and family resulted in a successful project. “Everyone that participated in the project and took time out of their schedule to help me accomplish this task, did more than I could ever ask for,” Elder said. The forestry department finalized Sam’s Eagle project in December and complemented the work and service that had been provided. During his time with the Boy Scouts, Elder has also been part of the Varsity Team, which competes in sporting and camping challenges, and the Venturing Crew 167 sponsored by Fairgrounds Ward of The Church of Jesus Christ of Latter-Day Saints. “The Scout Oath is ‘On my honor, I will do my best, To do my duty to God and my country and to obey the Scout Law; to help other people at all times; to keep myself physically strong, mentally awake and morally straight,’ and I have taken it upon myself to abide by the precepts of the Scout Oath, Law, and Slogan. I do my best to ‘do a good turn daily’ and to ‘be prepared.’ These Boy Scout practices have prepared me to become an Eagle Scout,” Elder said. McNary went 2-6 in the Greater Valley Conference this season but head coach Jason Ebbs expects a stronger finish at the district meet on Feb. 17-18 at West Salem. The biggest reason is the Celtics are finally getting healthy. 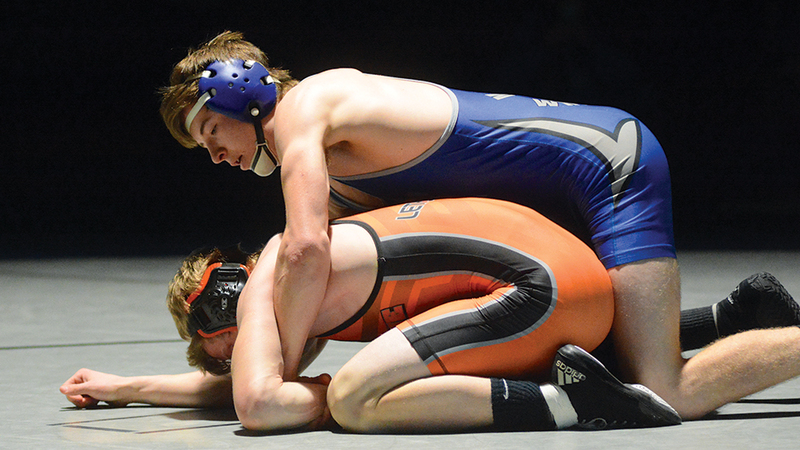 Led by Brayden Ebbs, who was the GVC champion at 138 pounds last season as a sophomore, McNary expects to fill 24 of 28 spots at the district tournament, only missing 195 and 220 pounds. Winning a second GVC title won’t be easy for Brayden, who has jumped to 145 this season, where he’s lost two matches, once to Ian Carlos of North Salem and then to Michael Abeyta of McMinnville. Senior Wyatt Kesler (152) and junior Isaiah Putnam (170) are both looking to return to the state tournament as well after both placed third in the GVC last season. Kesler missed the final two weeks of the season after injuring his knee in practice. “Every season there’s all these things you can’t predict and plan for and we’re taking our turn,” coach Ebbs said. At 132 pounds, senior Sean Burrows hopes to improve on his fourth place finish at districts a year ago and senior Carlos Vincent (160) is looking forward to competed at districts after missing last year’s tournament with an injury. At 120 pounds, Enrique Vincent also placed at districts last year but the rest of the Celtics lineup is inexperienced. Wrestling starts Friday at noon. Semifinals and consolation rounds will take place on Saturday beginning at 10 a.m.
Third through six place matches are scheduled to begin at 3 p.m. followed by finals at 4:30. The top four in each weight class advance to the state tournament, which is the following weekend, Feb. 24-25, at Memorial Coliseum in Portland. Athletics at McNary High School has a club of boosters—a non-profit organization comprised mainly of parents of the students who play sports. The choir and band programs also have organized boosters. Boosters not only support the programs but are also a big source of fund raising. Athletics and arts should be supported and boosted. We call on the administration of McNary High School to set the stage for creating academic booster clubs—after all, students are attending school primarily to learn and achieve scholastic excellence. Imagine the powerful message that would be sent with the establishment of a Mathematics Booster Club, or a Sciences Booster Club. We understand the school nor the school district are involved with booster clubs, per se, but they can certainly voice their support for the establishment of such organizations. Additionally, we would like to see academic booster clubs that have a focus less on fund raising and more on encouraging students to embrace and learn to enjoy math and science—boy and girl students (the world needs female scientists, too). Sure, math and science aren’t as exciting as a Friday night football game or a spring concert, but those subjects arguably will have a longer term effect on the students over their lifetimes. All students should have the opportunity to do well in the academic fields—teachers work overtime to help those in their classes that need a little more attention or assistance. A Mathematics Booster Club would be a good supplement to what instructors are doing in the classroom—think tutors on steroids. A few ‘Atta girl’s would go far to give a female student confidence to think they can one day help put man on Mars. (Hidden Figures, a film currently in theaters, tells the true story of the important contribution of women in NASA’s endeavor to put the first American in space in the early 1960s.) The key work done by women in science and math should not be footnote in history or a movie. 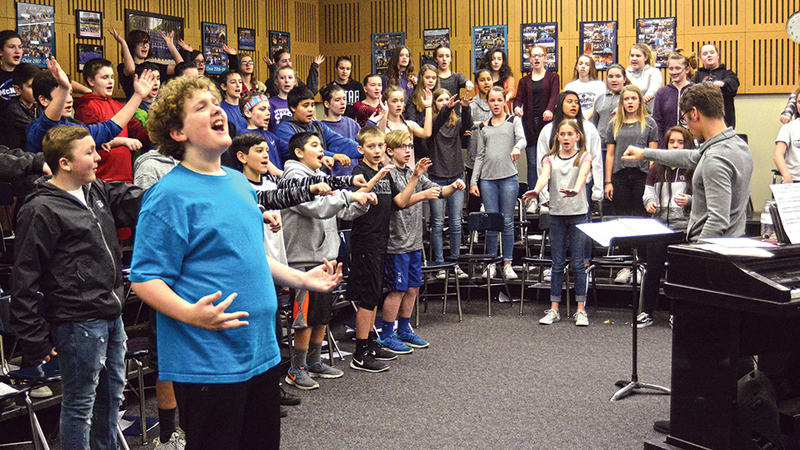 Not every student athlete turns their passion into a multi-million dollar career; not every choir member turns their love of music into stardom on the global stage. But, a student with a love of math, science or another academic subject has an excellent chance of continuing their education in college and perhaps helping put the first woman on Mars. That’s what an academic booster club can do for students today. When adults are excited about math and science, our kids can be, too. 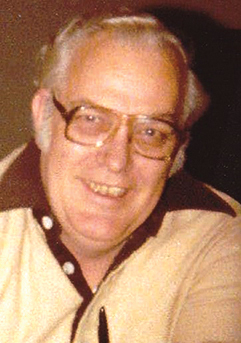 Robert “Bob” Riley Beck, 82, passed away Thursday, February 2, 2017 in Chanute, Kan.
Bob was born on January 1, 1935, in Chanute, the son of Clifford Riley and Bertha (Pruitt) Beck. He graduated from Valley Center High School in 1953. He joined the Navy after graduating high school and served four years. On Nov. 22, 1958, he married Donna (Bryant) Beck in Mechanicville, NY. 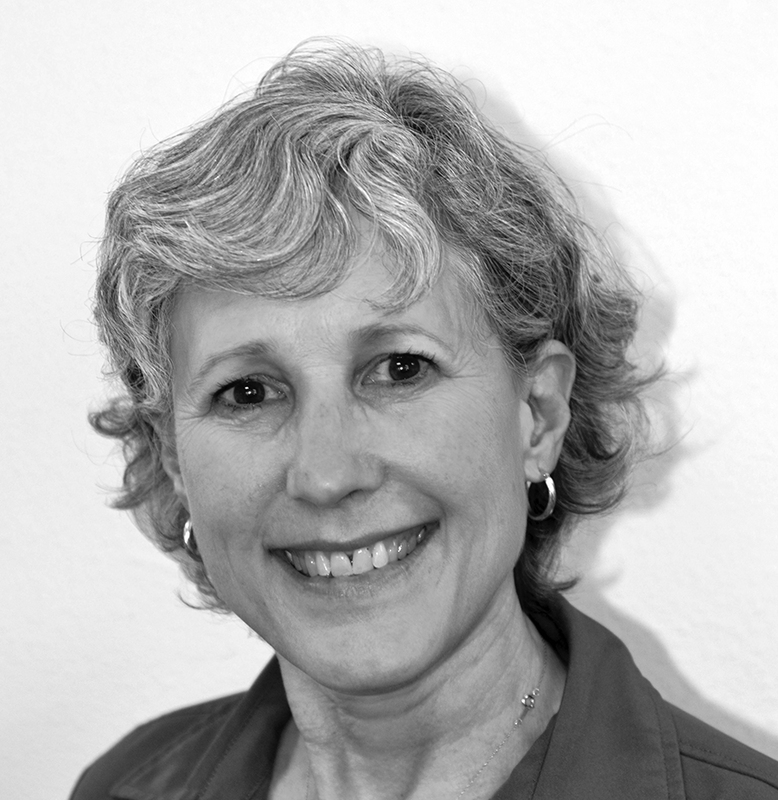 Bob and Donna lived in Woodbridge, Virginia from 1963-2001 and then moved to Keizer, Oregon. Donna passed away in 2003. In July 2012, Bob married Mary Lou Montgomery and moved to Kansas. 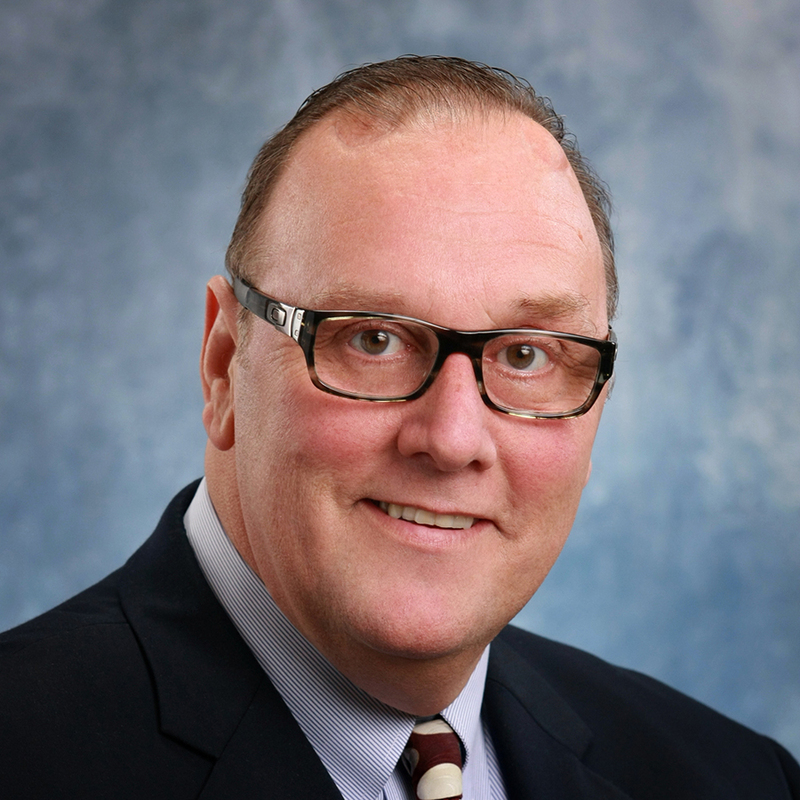 Bob worked as a systems design engineer for Melpar Systems in Falls Church, Va., for 30 years. While living in Virginia, Bob enjoyed camping with his family and fishing. He also enjoyed playing golf and played almost daily. Bob is survived by his wife, Mary Lou Beck; his daughters Sandy Lacy (Beck), Melanie Beck, step-daughter Sheila Brown, granddaughter Jennifer Beck, step-granddaughter Riley Brown, and great grandson Benson Beck. He also left behind three sisters and brothers-in-law, Eudora and Orlin Loucks, Shirley and Bob Smart, and Nancy and Tom Ummel. He was preceded in death by his sister Lois Koehn. I’m afraid because Fukushima has poisoned our ocean and the problem isn’t going away. Our fish and all life in our ocean is now contaminated. We are breathing this and I saw pictures of the seals, salmon and other fish with cancer tumors all over them. What does this mean to us? What is needed to jumpstart economic development in city? The editorial in last week’s paper, Call it a day for the EDC (Economic Development Commission) reflects thoughts I have had for a while. And I agree that a re-think of the city role in promoting economic development, particularly in the context of our Economic Opportunities Analysis in the Comprehensive Plan, would be helpful. At regional and state meetings, I hear about opportunities and success stories that make me wonder if we have missed chances to bring dollars and programs here to deepen and strengthen our economic base. The meeting with Regional Solutions coordinator James Labar was particularly helpful in informing our business leaders of the program and services available toward streamlining state regulatory processes so projects could get done. The Commission also heard from SEDCOR and the Mid-Willamette Valley Council of Governments, both of which provide economic development programs and opportunities. The piece that did not come together was how a city revolving loan funding could jump start redevelopment or expansion of businesses; in the meantime, however, the economy has taken hold and private investment has significantly advanced the business landscape of River Road. Frank discussions regarding the status of the River Road Renaissance vision made it clear that the foundations of that plan have now been incorporated into our development code so each redeveloped property makes those improvements as part of the project. However, the further portion of the vision was for sections of River Road businesses to embrace a sector identity, with branding and logos to create distinct districts in which clusters of business types would be established. As the city found out years ago with neighborhood associations, just saying that you are a ‘district’ or a neighborhood association does not make it so. Both are organic in nature, born of a common set of values, goals or concerns. The common values and goals that are already in place are for quality business plans, space to grow and park, pricing that reflects the local economy rather than trying to price like Portland or Seattle, and meeting growing and changing demands for goods and services that cater to the emerging millennial generation’s buying power as well as the significant baby boomer capital holdings. These values are not unique to sections of River Road but apply to our entire business community. I want to thank the members of the commission, each of whom has shared their time and expertise. There was nothing in it for any of them, except the knowledge that they each have experiences that can help guide and shape policies to ensure they are in the best interests of the entire community – business included. Going forward, we have an economic opportunities analysis that will guide any urban growth boundary expansion for employment lands. We have career-technical education programs that are preparing our students for well-paying jobs in many industries. We have a growing population that wants a Keizer that provides the goods, services and amenities that will continue to make Keizer a great place to live. And we have the Keizer way of facing these challenges and opportunities and solving them together as only Keizer can. I’ve lost track of how many times the counters on the digital cameras I use as part of my job have reset themselves, and the cameras only reset after 10,000 pictures. Most of those pictures will never – thankfully – see the light of day and the few I do remember wouldn’t cause me to extend all five fingers of one hand. But, every once in a while, an image sears into my memory. 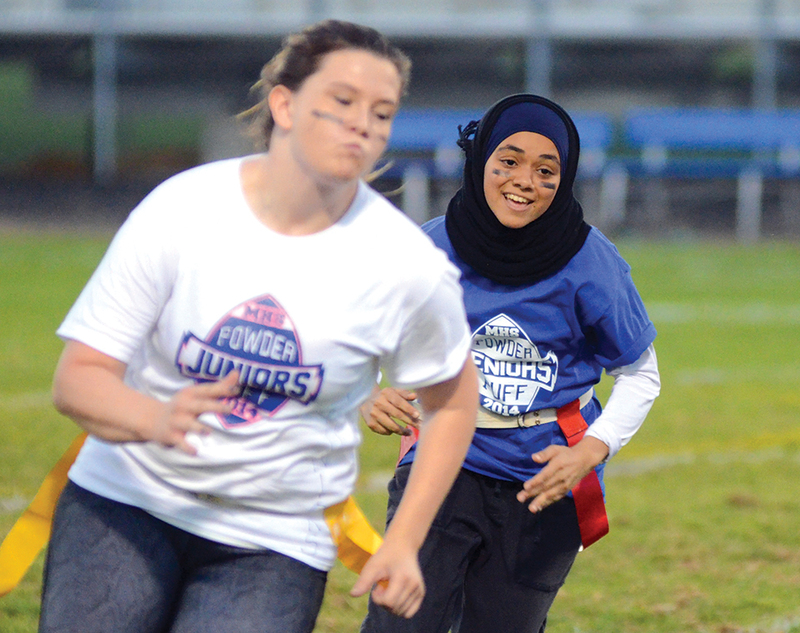 One of them is a photo of a McNary High School senior playing in the annual Powder Puff football game at the school in 2014. In that photo, then-junior Gabby Jackson is running up the field slightly out of focus, but with her best “game face” on. Trailing Jackson is then-senior Khawater Hussein, bright-faced with a gleeful smile, under a hijab—the traditional head covering worn by some Muslim women. Eight months later, Khawater was chosen by her peers to deliver the commencement address at graduation. Her graduation cap rested atop her hijab during the ceremony. My heart swelled with unexpected pride in the students who found connection in her words and didn’t let differences in appearance cloud their hearts. I thought of Khawater again as my family and I sat watching Arrival at a Salem theater recently. Without offering too many spoilers, here’s the gist of the movie: aliens descend on earth and it becomes the responsibility of a university professor to help the military decipher their language and intentions. What starts as an exploration of the unfamiliar quickly ramps up to crisis when several other countries, with their own teams working on the problem, go dark and stop communicating with the other teams putting the human race and the aliens on the path to conflict. One moment in particular stuck out to me. Oddly, it had nothing to do with the characters in the film. It was a sweeping shot of the scene at one of the alien landing sites showing a throng of cars and campers, civilian onlookers and gawkers, being held at bay by a military barricade with the alien ship in the distance. My 13-year-old daughter, Ameya, sat next to me during the movie and some of the implications of travel bans came into sharper focus. I couldn’t help but think of Ameya and Khawater being held apart from one another. I have no idea what deep reservoir of strength Khawater was tapping into on a daily basis to don an overt symbol of her Muslim faith, but I am certain I have never had to plumb such depths. The thought that my daughter’s chances to learn from such a woman – to share each other’s stories, the very thing that often so effectively bridges the gaps between people of different backgrounds – would be diminished by something like the hastily-deployed travel ban from seven predominately Muslim countries opened up a vacuum in my chest. It is possible that a travel ban might make some feel safer, but it seems like a flimsy layer of protection. Even with the most extreme vetting, or the most objectionable of interrogation tactics, it wouldn’t be enough to stop the most determined bad actors. Moreover, given the circumstances of recent mass attacks, bad actors don’t even have to visit our soil, they need only connect with someone already here and willing to be influenced. There have already been many costs associated with the travel ban, from separating families to a diminished view of our country in the wider world, but there is no way to account for the opportunities we’ll miss out on if the ban is allowed to stand. The ban prevents – and excuses – us from doing the real work of connecting with our fellow world citizens. As hard as that work may be, it is likely the only sure path to security. Immigration, immigrants, refugees, green cards, and illegals have often found their way into topics of discussion. Whether or not in each case the individual or group of individuals found acceptance or rejection had a lot to do with their point of origin. A welcome mat for western Europeans while the door is mostly shut for Asians. My third generation Scotch-American father entered a community of Finnish immigrants, married my second-generation Finnish-American mother, and then along came me, an American who views the Finns as among the finest people on earth while my wife, a third generation Irish-American, affects my attention by affection. What’s relevant to all of us and the quality of our lives here is this: How many new arrivals can the U.S. handle? And that goes for Oregon, too. Is it that our nation and state shall be the world’s dumping ground, filled with overflowing numbers from elsewhere who have not been able to keep their homelands livable. Here’s my view in direct terms: I don’t care from where anyone hails, their religion, their cultural tags, whatever, we’ve got enough people in Oregon and there’s very little room for more. A handy example to underscore my exploding population concern looks at just one of Oregon’s metro areas, Portland and its suburbs, plus those folks who choose to live in Vancouver and environs, and down from PDX to Wilsonville and over the Willamette River immediately south of it. Then there are the continuously growing-more-congested metro areas of Bend, Eugene, Medford, Salem and others underway, the burgeoning growth around virtually every nook and corner that’s habitable by the human species. When Portland is mentioned, Oregonians I know turn up their noses as they complain about the high costs of everything, lack of affordable rentals, the inching along or stalled traffic, the gangs and crime, the homeless and jobless, the road rage and the infernal difficulty of getting anywhere a person would want to go in that area. There are just too many people and the problems associated with it just get worse with each passing year, so much so that governance in most of Oregon’s places is already in constant crisis mode. Meanwhile, every time an announcement is made about allowing more refugees into Oregon, an additional number arrive here or nearby. The impact of a bulging population (Oregon already attracts the likes of the Bundy gang, other American supremacists and native-born radical terrorists) spills over into every direction. Oregon is now close to devoured, while homes are built in fire-prone forests, farmland turns into housing developments and the radicals want to turn wildlife refuges and national parks into mining pits, beef-raising ranches, residential tracks, golf courses and shooting galleries. Wherever one looks, with a population of 4.3 million, we will have reached population infinity. Read far and wide is that, if we don’t get more refugees and increase the population, we won’t have the brain power and youth to sustain our way of life. At present, we have those who want to protect and sustain sanctuary campuses/cities/and the state of Oregon with a no-matter-the-consequences attitude, while our state borders remain porous, illegals in number are everywhere, and crimes are committed in multiples every day. Oregon’s legislators could work together to control the state’s political and economic forces; unfortunately, too many of our Capitol-ensconced leaders, who could tackle direly-needed tax reform and control those charitable groups and sanctuaries that bring people here and then place them on taxpayer support in a state where the treasury’s already depleted, can only pretend to perform good works.